Echo Station 5-7 | How we doin? Same as always. 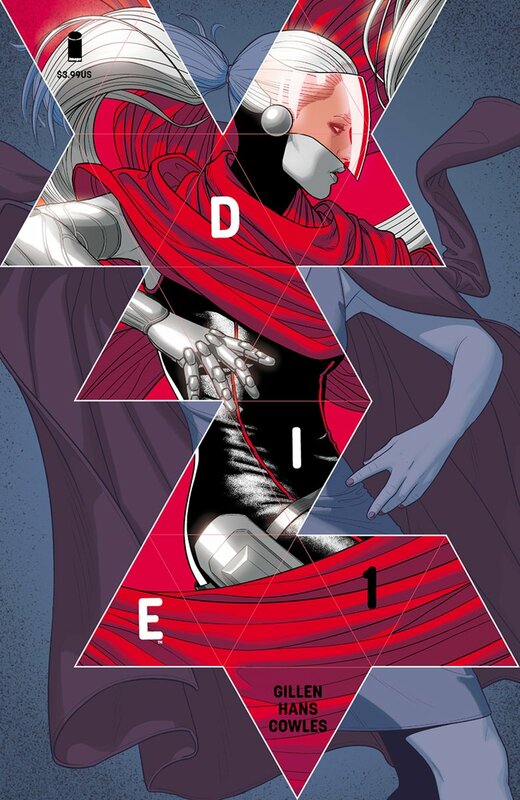 I think I first heard about Kieron Gillen’s new comic book series DIE from io9. I was familiar with some of Gillen’s work, particularly Über, about a WWII arms race to develop super-soldiers, and his amazing run on the first Darth Vader series a couple of years back. 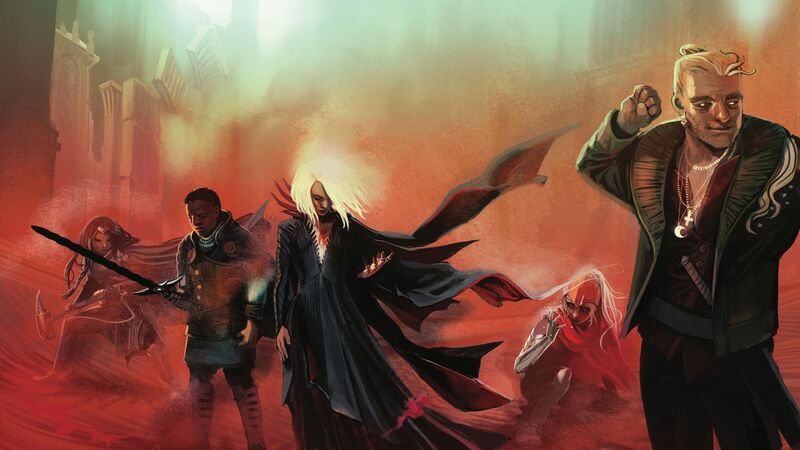 DIE is about a group of high school kids who get transported into the world of their roleplaying game and vanish from our own, for two years. Eventually they make it back, but can’t say anything about where they’ve been. Twenty-five years later, as adults whose lives have been variously shaped — or warped — by their experiences in the other world, they get pulled back to the game world. All of this is established in the first issue, which definitely intrigued me. But the second issue completely blew me away. It’s going to get a bit spoilery, so if you want to stay pure, stop reading this and go pick up the comics. Issue 3 just hit the stands last week and most well-stocked comic book stores will still have the first two (or get ’em online). I believe the plan is to have trade collections released every 5 issues, out of a planned 25 or so. issue 1 — some of the interactions from the first issue make a lot more sense in light of the things we learn in the second issue, particularly Chuck’s line to Matthew about his sword, which would have been a potential friendship-ender if being a tactless wiseass wasn’t Chuck’s whole schtick. That’s a LOT of work for a scene to carry and Gillen makes it look easy. On the first read I wasn’t aware of everything that was going on, I was swept up in the story. But I knew afterward that I had just read something special. So I read it again, and thought about it a lot. In fact, it was about all I could think about for a couple of days. I was impressed both as a consumer of fantastic literature and as a gamemaster. It made me want to write better encounters. Issue 3 pulls off a similar “wow this hits on a lot of different levels at once” feat, in an entirely unexpected direction. That will be a story for another post, perhaps. Three generations of Space Turtles. Back row: my Mobile Frame Zero turtles, minus their ECM projectors. Middle row: the six turtles that will become kits for kids I know. From left, there are two yellows with different guns, an orange, a purple, and two pinks. Front row: the Space Turtle from the Exo-Suit set, inspiration for all the rest. bundle the parts and instructions for each turtle, and send them. I covered #1 and part of 2 in the last post, although I didn’t show the final versions. I used my spare time last night and tonight for 3 and 4. I’m making these for nieces and nephews and one family friend, and I’m customizing the instructions for each turtle to include the recipient’s name. That’s neither here nor there for you, so for this post I’m using versions of the instruction cards without the names. Feel free to swipe them if you find them useful. 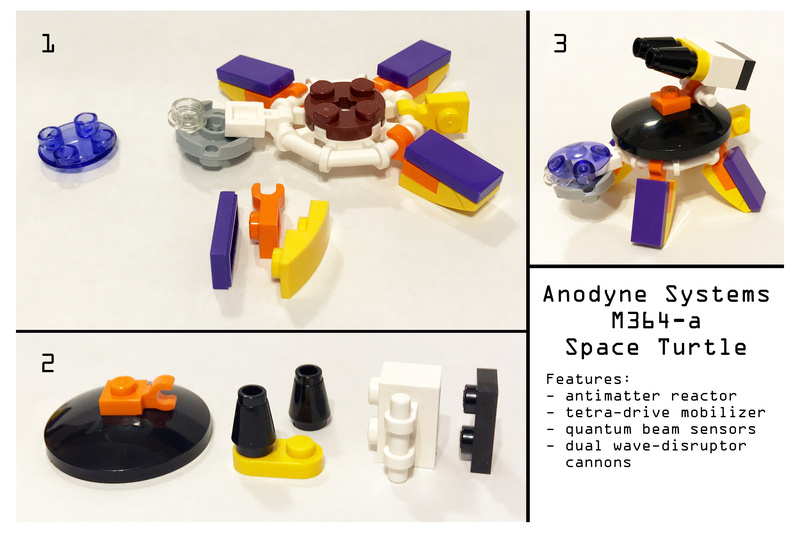 According to Peter Reid, the classic Space Turtle is the Anodyne Systems M364. My turtles aren’t classic Space Turtles – they have different heads, legs, shells, guns, and even tails. But I think they’re still recognizable as Reid-derived Space Turtles, and I wanted to pay homage while at the same time making it explicit that my turtles were variants. So I added a letter designation to the M364 for each one – the letter being the first initial of the kid who will be receiving that kit. 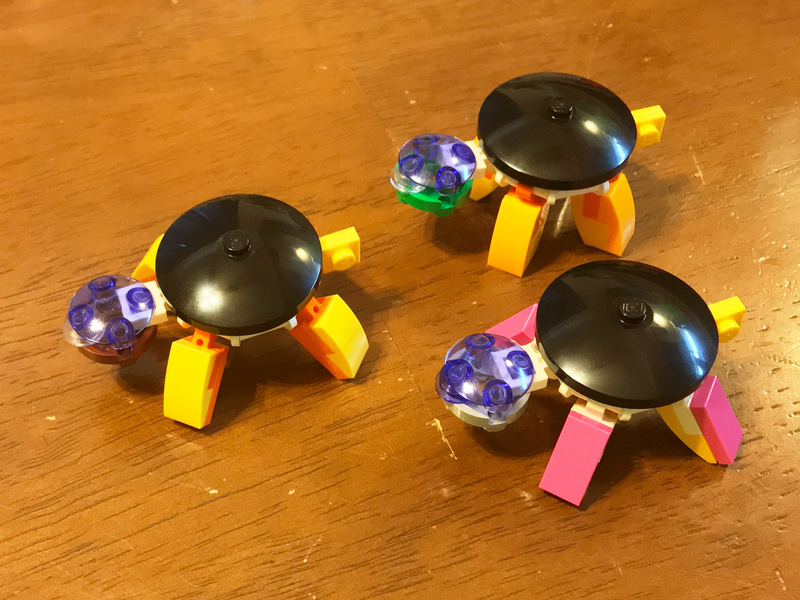 I did two yellow turtles and two pink turtles for kids in different households – everyone under one roof gets a unique turtle – which is why there are four sets of instructions posted here instead of six. I made the instruction cards in the aspect ratio of 2:3 so they’d work as 4×6 photo prints, and I added a little white gutter around each one because I have learned from bitter experience that photo printers often lose a little around the edges. The order is at the printer right now – I should be able to pick up the instruction cards later today, and package the turtles to ship out tomorrow or Monday. Is this the end of the march of the Space Turtles at ES5-7? Maybe. I have a load of other things to be getting on with. 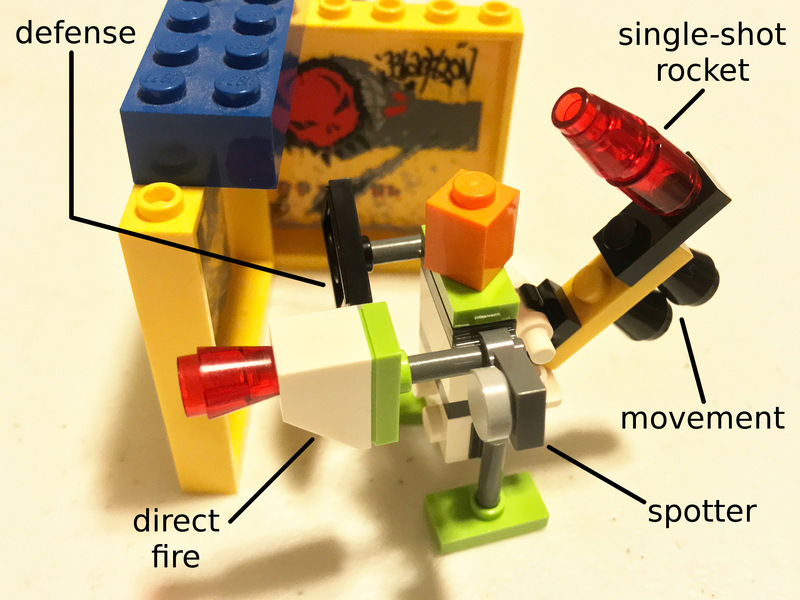 But now I’m tempted to put in a Bricklink order and build some color-coordinated Reid-style turtles with the ‘right’ parts. If I ever do, the results will surely wind up here. 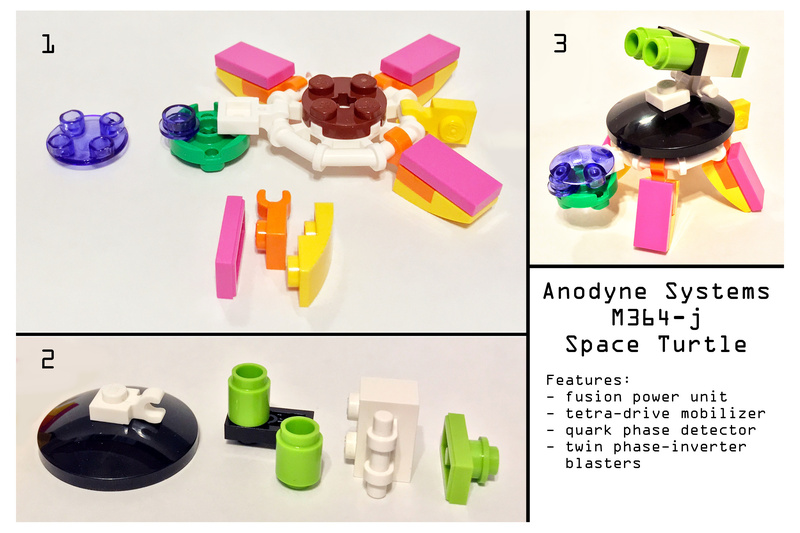 I mentioned in the last post that I was planning on making some Space Turtle kits for my nieces and nephews. 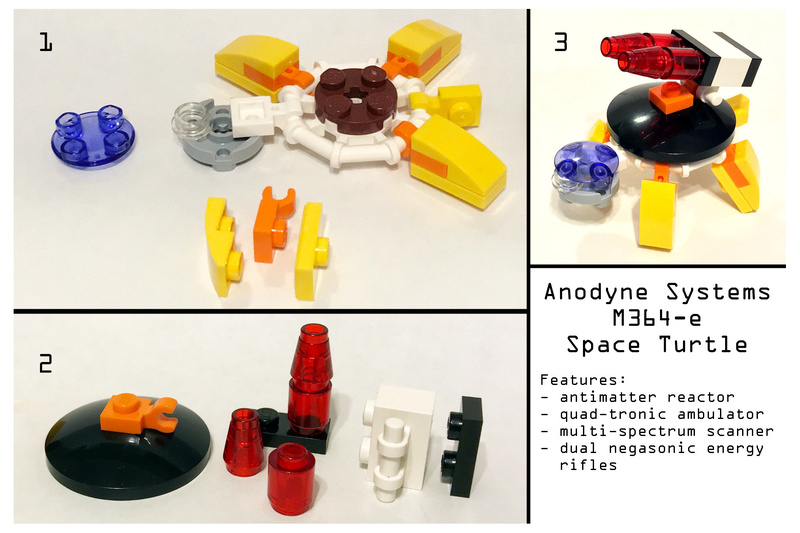 I could have gotten all the parts for official Space Turtles from Bricklink, but I wanted to take advantage of a couple of currently available polybags that have almost all of the necessary pieces: 30404 Friends flower polybag, and 30525 The Guardians’ Ship. 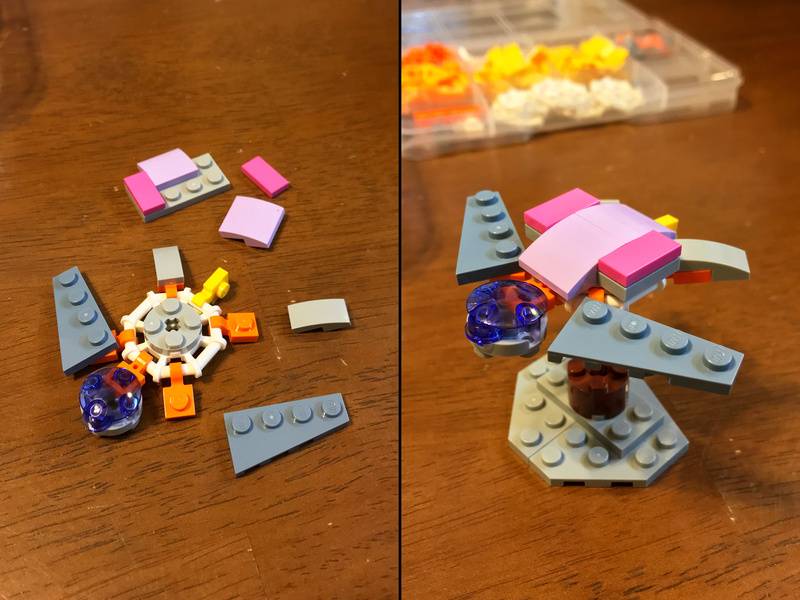 The limiting elements are the octagonal pieces from the flower polybag (2 per) and the purple transparent 2×2 boat plates from the ship polybag (3 per). 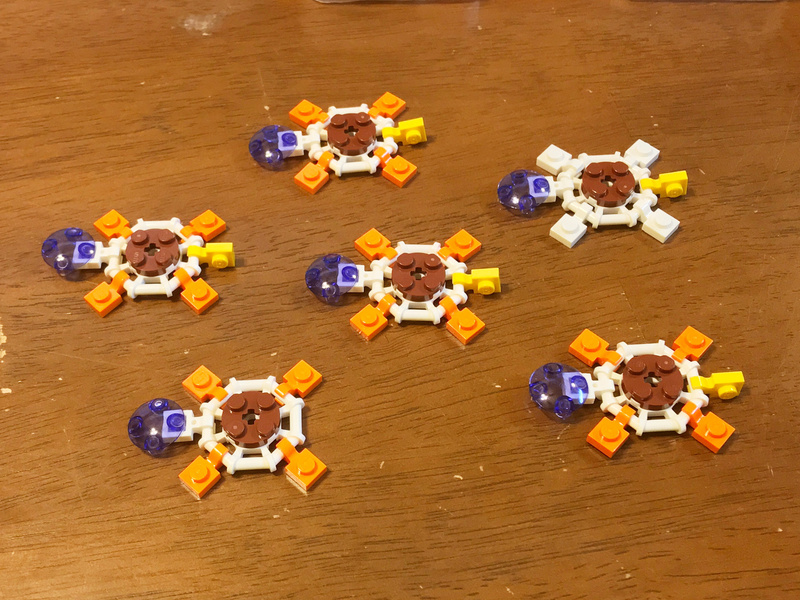 I wanted to make 6 turtles, so I needed three of the former set and two of the latter. 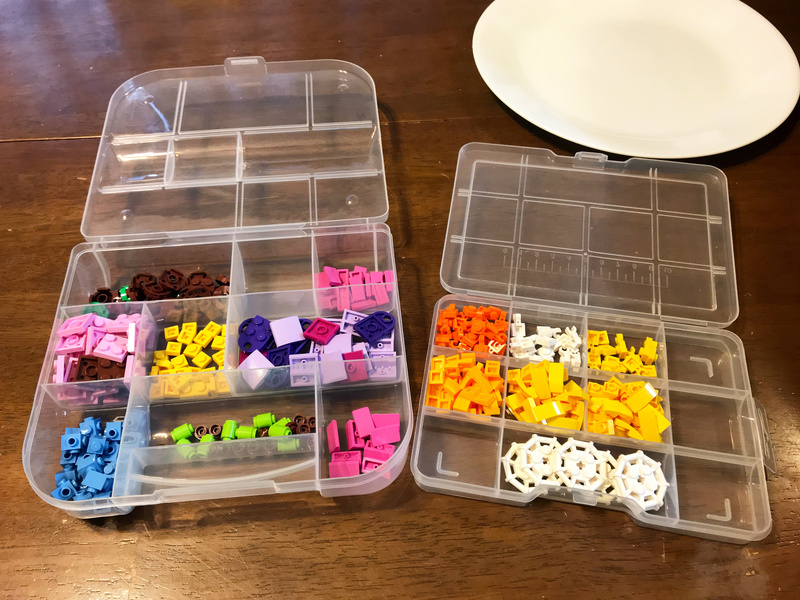 I also picked up a couple of cheap plastic organizer bins from the dollar store down the street, for sorting parts. The ship polybag in particular has a load of great parts that you don’t need for Space Turtles, so if you follow in my footsteps you’ll have a lot of nice bits left over. 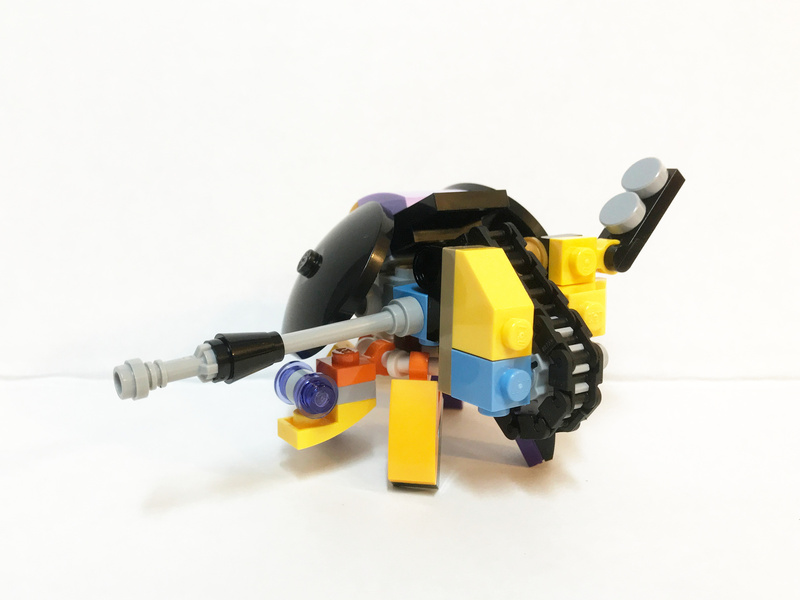 Two of the spaceship wing pieces inspired me to make this sea turtle as an alternative build. Okay, back to Space Turtles. 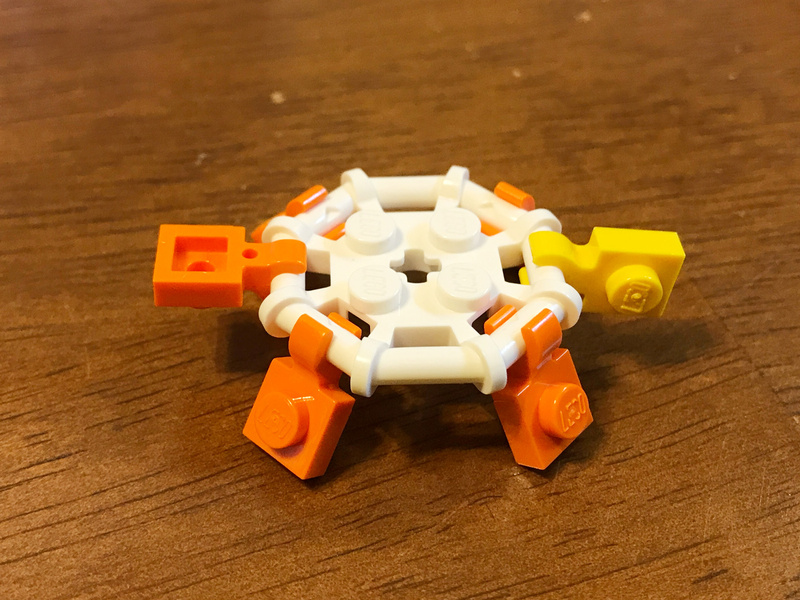 Here’s a core chassis made with only pieces from the flower polybag. 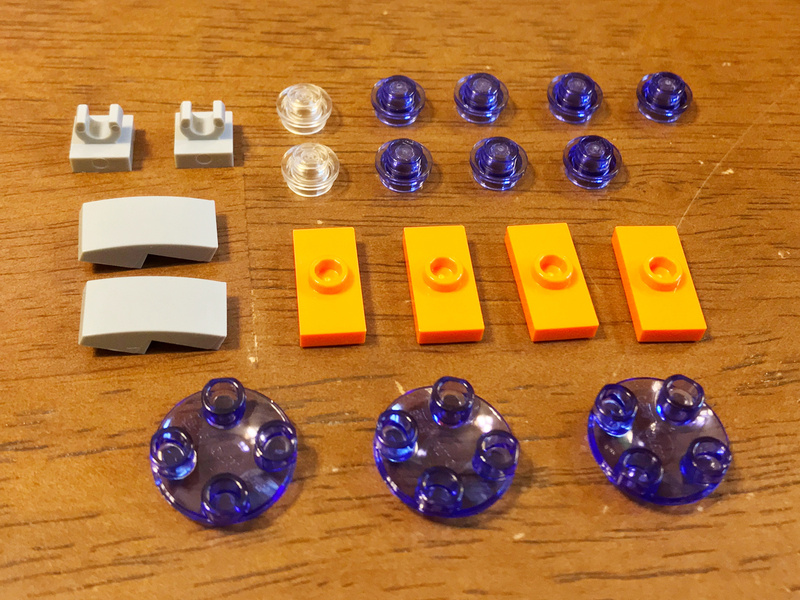 Here are the pieces of interest from the ship polybag, especially the boat plates for making heads, and the single-stud transparent pieces for making eyes. 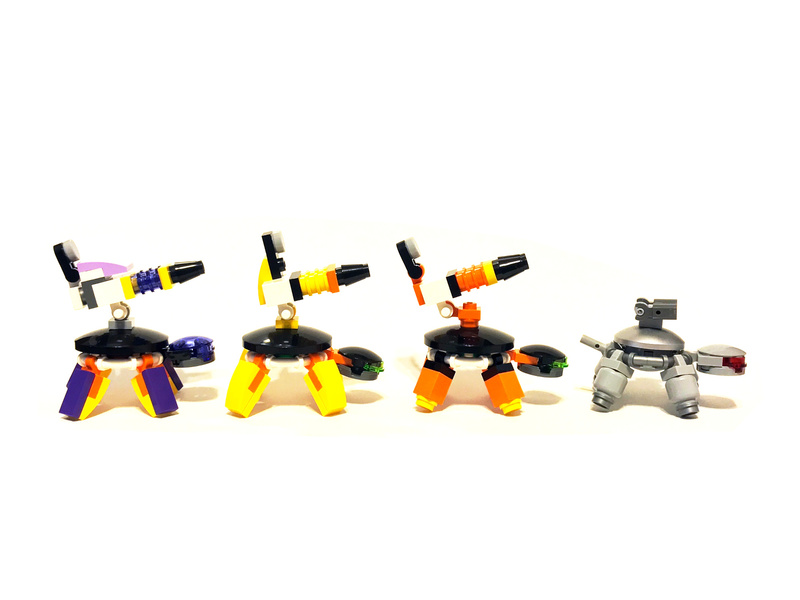 A little fleet of turtle chassis. I only realized later that I’d left the tail off of the one at the left front. 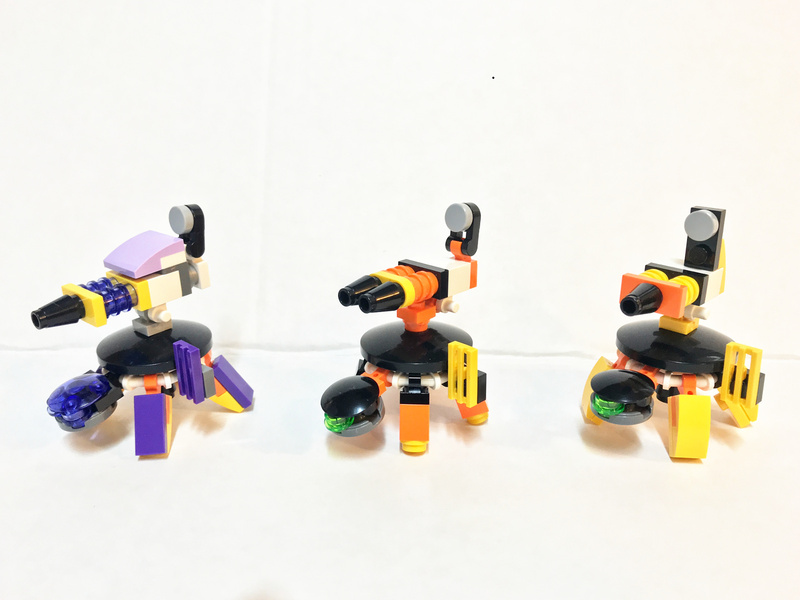 The three leg variants I used. For this photo I used only pieces from the flower polybag, to show that it could be done, but for the production models I subbed in jumper plates and smooth plates in other colors. Here I’ve also added radar-dish shells – the radar dish is the one bit that doesn’t come in either of the polybags. 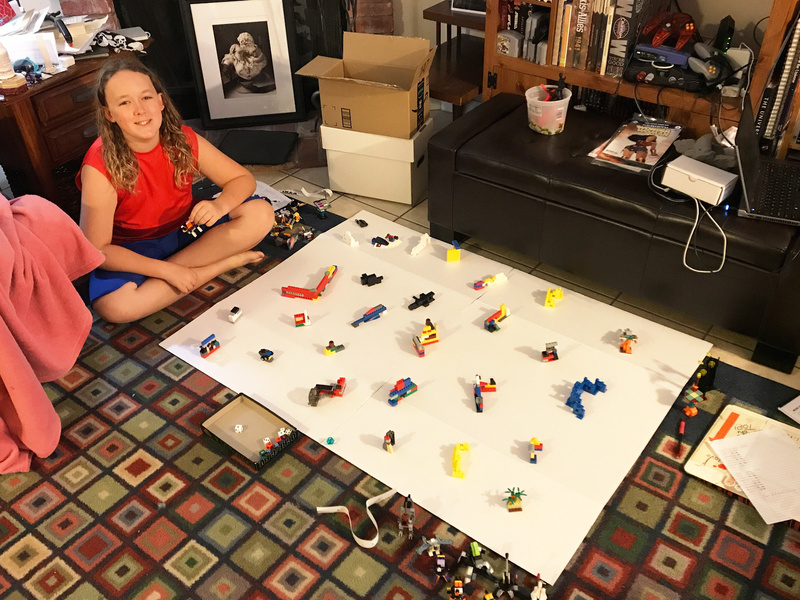 Fortunately our local Lego store has a ton of them on their pick-a-brick wall, so I’ve got a warchest for future turtle-building. 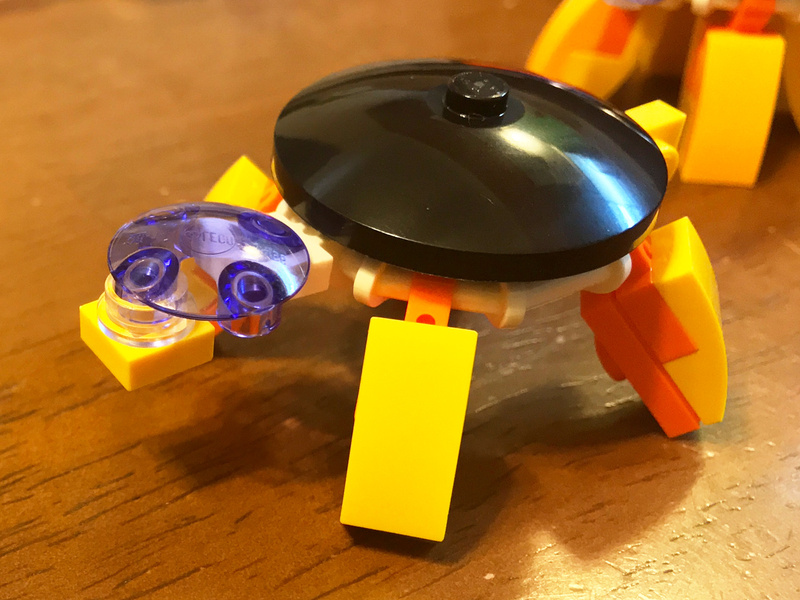 Here’s a complete but unarmed turtle sporting the same head design as Peter Reid’s original Space Turtles, including the ones that appeared in his book LEGO Space: Building the Future . They look cool, but the un-reinforced single-stud connections at both ends of the boat plate do not spell “durable playability”. 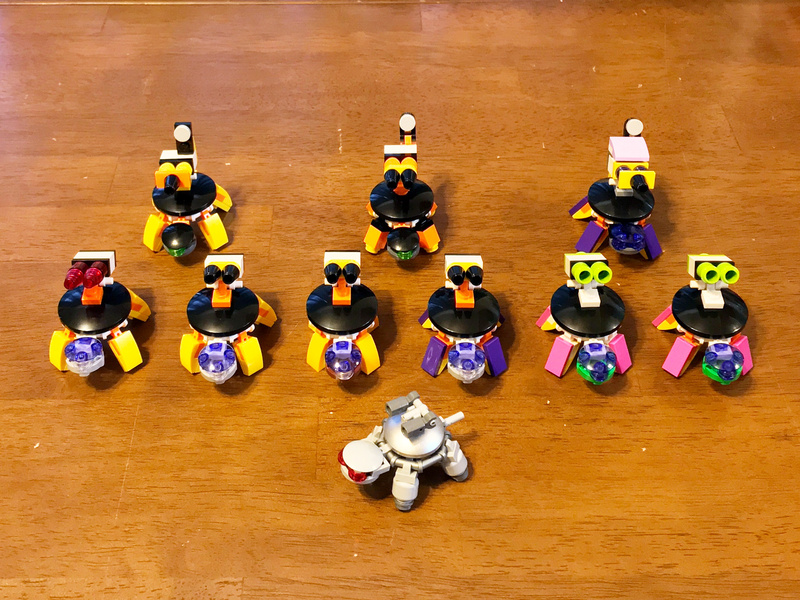 Since I am making these turtle kits for kids to build and play with, I wanted a more solid connection. Fortunately both polybags have round 2×2 plates that snap pretty securely onto the neck clip at back and the eye stud up front. The flower polybag has one in green and several in brown, and the ship polybag has a couple in gray. I was trying out color schemes here – I ended up swapping them around a bit. Space Turtles need laser guns, it’s just a fact. Here I built the gun out of polybag parts, again just to show that it was possible. The orange jumper plate and click-hinge parts came from the spaceship, the rest from the flower. Each ship has only one click-hinge, so this is no way to arm a fleet of Space Turtles. 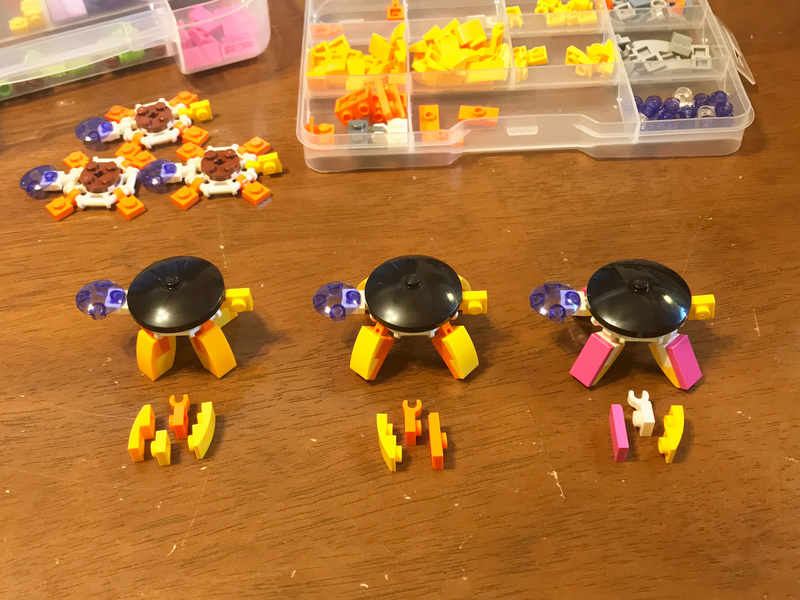 For the kits, I imported pieces from other sets – I’ll show those off with the completed production line in the next post. What the? You’re not supposed to use record sheets with Mobile Frame Zero – the different systems (attack, defense, movement, etc.) are represented by differently-colored dice, so if you know your frames and you have enough dice of different colors, you’re good to go. OTOH, if you’re just starting out and don’t have your frames all memorized, and also don’t have enough colored d6s, record sheets can be handy, both for remembering how your frames are equipped and for writing down rolls. Here’s one I made for my recent games with London. The idea is that you circle the dice for the systems your frame has and scratch off the rest. That tells you which dice to roll each turn. As your frames lose systems, you scratch them off, too, so the record sheet always represents the actual state of each frame in real time. I added little vertical dividers to separate turns, but I only made two blanks for each turn. If you roll three dice, just write small enough to squeeze in all three numbers. You can draw arrows for bringing white dice rolls down to fill in or replace other systems. Oh, we finished our big game yesterday morning. I lost, badly. I had planned for my soldiers to screen London’s forces while my artillery picked him apart with battlefield-wide spotting. But through a combination of inexpert play and some truly heinous dice rolls, my front line got shot to pieces and then his soldiers advanced and blew away my artillery at direct-fire range. I shot up three of his frames pretty badly and destroyed a lot of cover, but that’s about it in terms of tactical accomplishments for me. The photo at the top of the post shows one of London’s transforming Land-Air Mech (LAM) frames flanking my Tactical Turtle and blasting the crap out of it. Our lack of dice also explains why there are blue post-its stuck to the battlefield with the defense rolls and spot numbers (if any) for each frame. I might have gone down to ignominious defeat, but I learned a ton. I had one frame with double defensive systems and double spotters, which was intended to just hang back and put spots down all over the battlefield. After the game I decided that was a waste, as long as that frame was hanging back I should have replaced one of the defensive systems with artillery (making it equivalent to my tactical turtle and ice tank) so it would have some teeth. If I had it to do over I’d probably have three frames with double spotters, artillery, and defense, screened by five standard soldiers (one each of movement, defense, spotting, and direct fire). And I’d be less cavalier about advancing my frames without adequate cover. London played with great restraint, advancing when cover was available and smartly pivoting back or sideways when the cover got shot away. He earned the win, awful dice rolls notwithstanding (he had some stinkers, too). After two months of BattleTech and Mobile Frame Zero, I think we’re a little wargamed-out, so we’ll see if we get any more games going soon. Before we go on to something else (probably D&D or Star Wars), I’d like to teach him Ogre. If that happens, it will truly be a story for another post. London and I have been playing a lot of wargames lately. First we had a big run of BattleTech games, starting a little over a month ago. 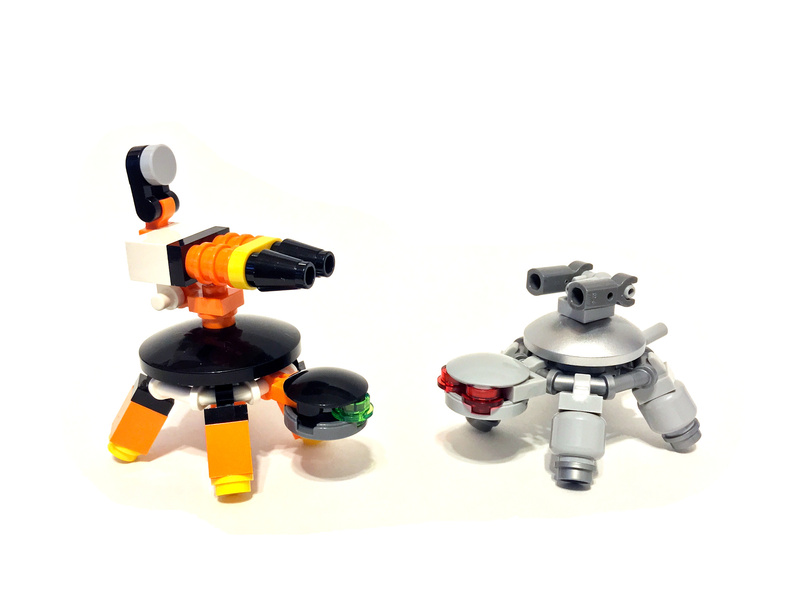 For one of our battles, we didn’t have appropriate minis, so we built tiny Lego models of a couple of mechs. 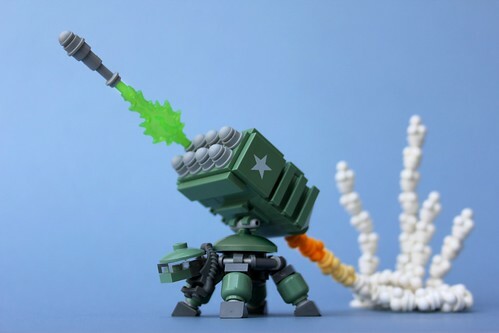 And that re-fired our interest in Mobile Frame Zero, a Lego-based miniatures wargame. 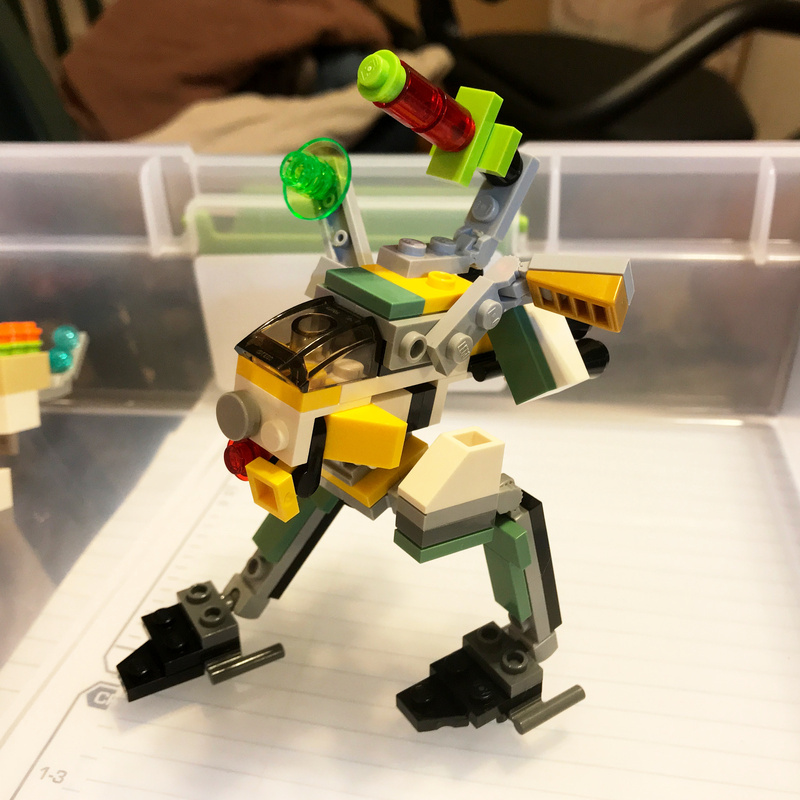 We had first learned of Mobile Frame Zero back in 2014 when we were on a Lego mecha kick. 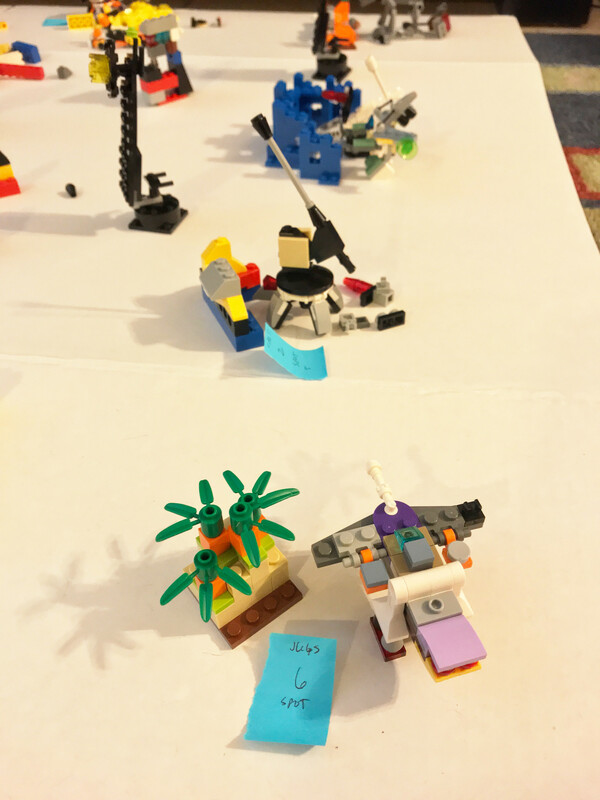 We both built and equipped a squad – that’s mine in the photo above, built exclusively out of parts available at the time on the local Lego store’s pick-a-brick-wall – but by the time we were done building, our interests had shifted. That Christmas we picked up the D&D intro box set, and by January we were rolling with the Dinosaur Island campaign. We didn’t come back to wargames for a while, and when we did, it was to play BattleTech. The game was a blast. It moves fast, and as terrain and frames take damage, you snap parts off and leave them on the battlefield as wreckage. 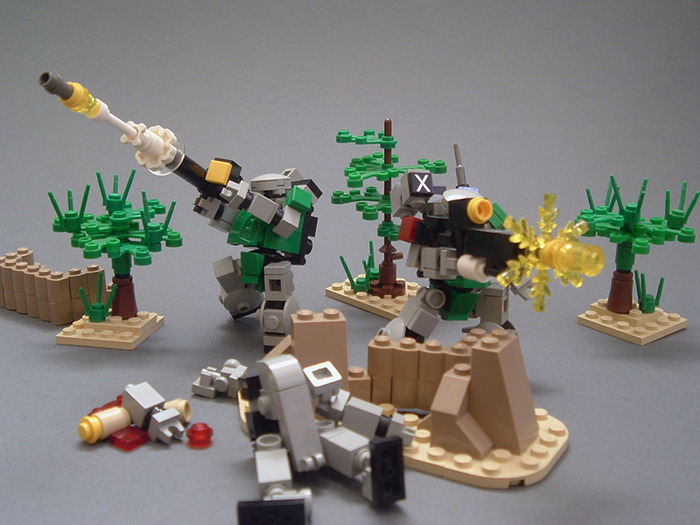 It combines a bunch of our favorite things: mecha, wargames, violence, destruction, and Lego. 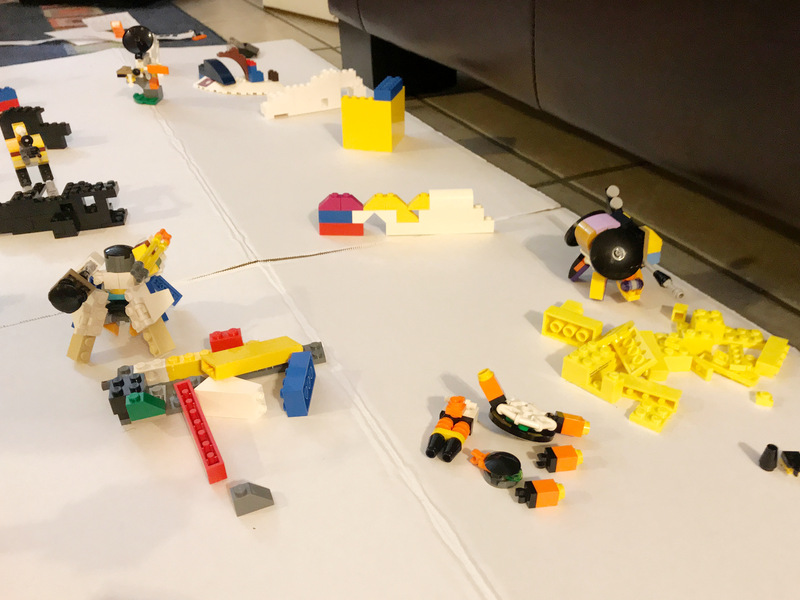 We spent the last few evenings building slightly larger, prettier frames for an 8-frame battle, which we set up on the living room floor this afternoon. 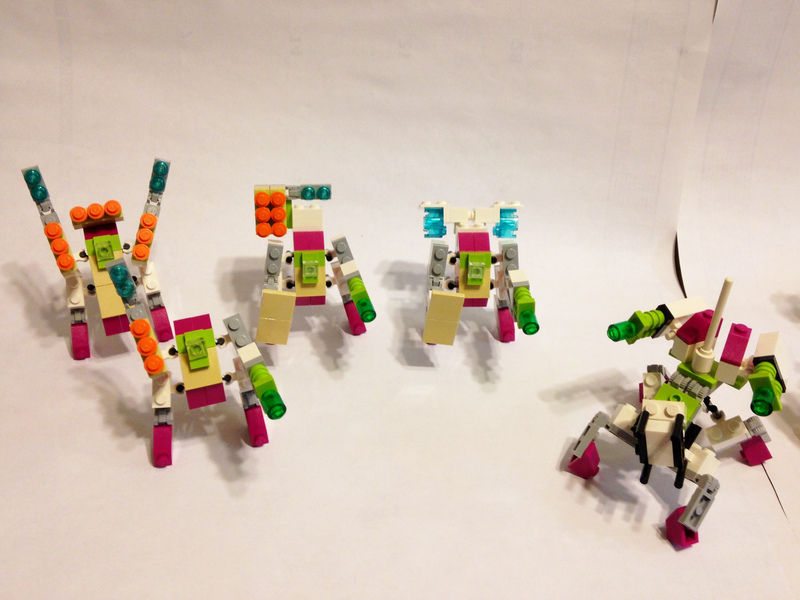 Shown above are my soldier frames, based on Peter Reid’s space turtle design. 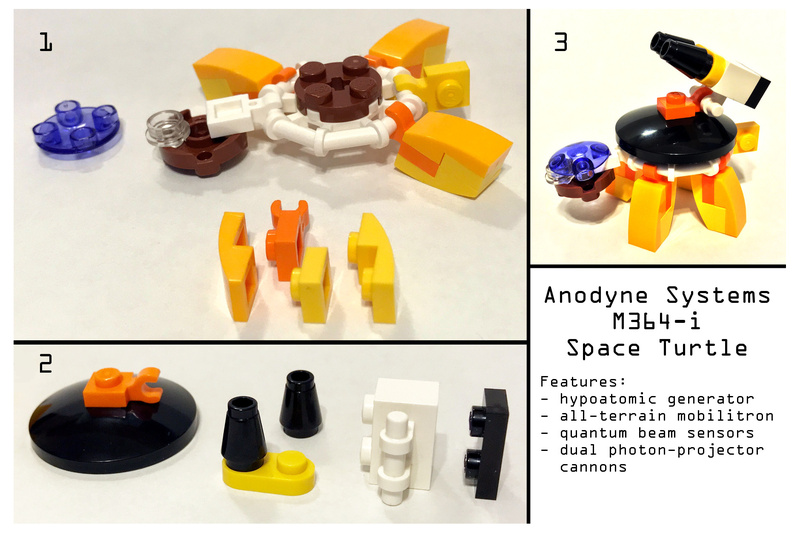 The space turtle was one of my favorite bits from the Exo-Suit set, and they’re ridiculously easy to build and equip. 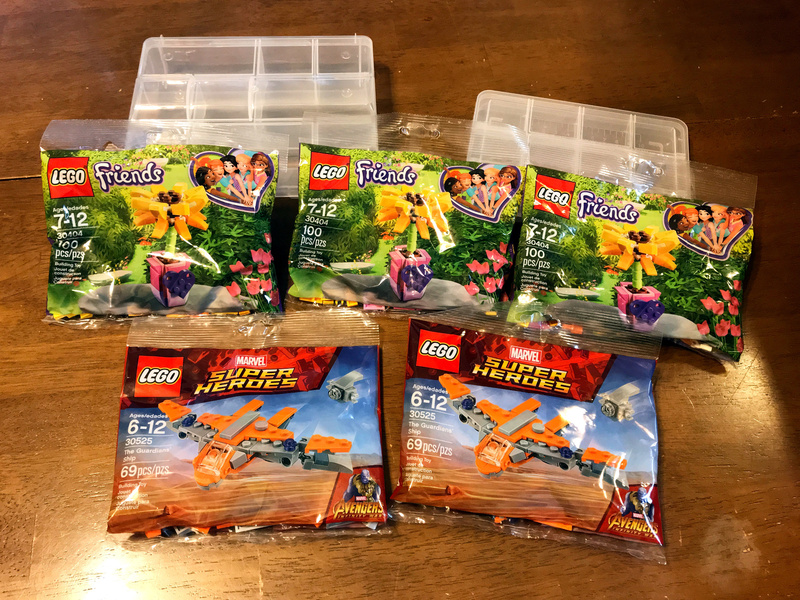 Right now our local Lego store has the black radar dishes on the pick-a-brick wall, and almost all the other parts came out of the Friends flower polybag that is on store shelves right now, so the necessary pieces are readily available. The grille plates mounted on the left side of each turtle represent ECM arrays for defense. Gray circle plates on top are radars (for spotting), black cone rocket nozzles just visible on the underside of a couple of the turtles are jump jets, and the direct-fire weapons systems are obvious. 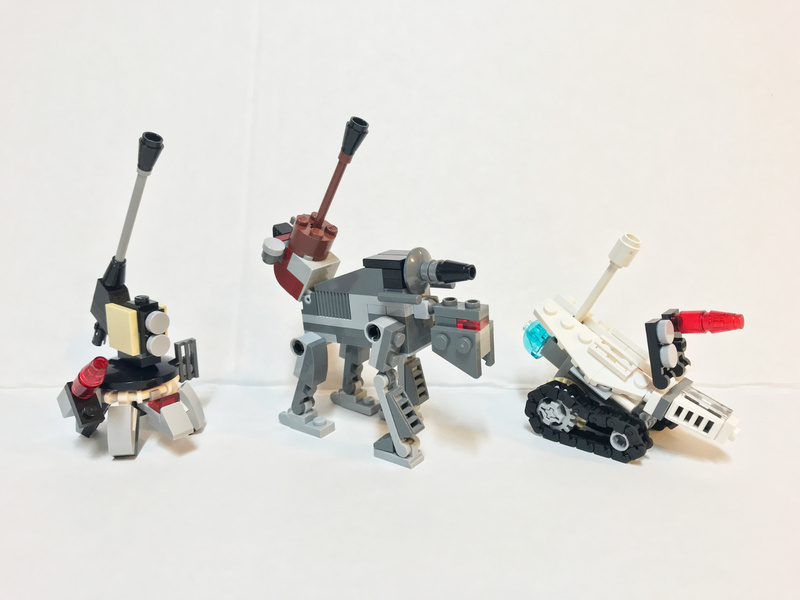 Here are my artillery specialists: another space turtle at left, and then lightly modified versions of two other polybag sets, the Star Wars AT-M6 and the Ninjago ice tank. Our local Target stores still have plenty of ice tank sets in the checkout lanes, but AT-M6 sets are getting scarce, at least around here. 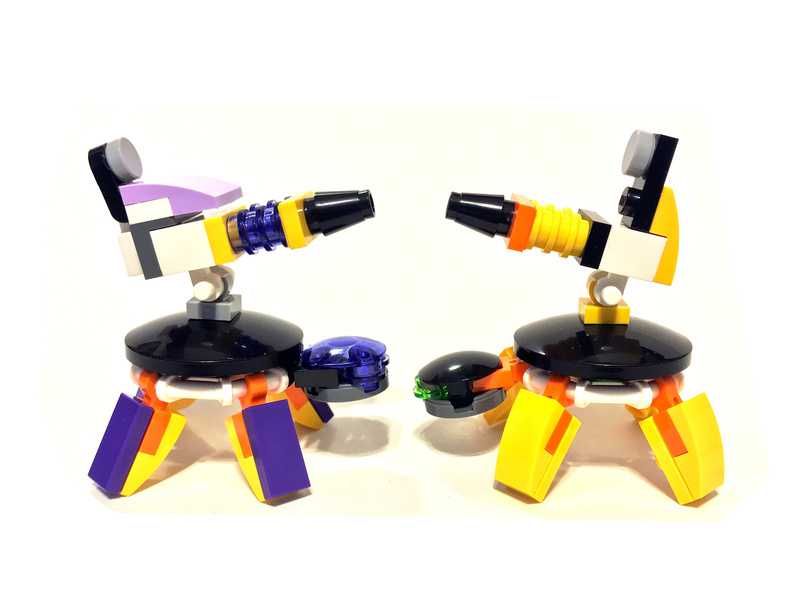 The tactical turtle and ice tank are both equipped with ECM, double spotting systems, artillery cannons, and single-shot rockets for close-in attacks. The AT-M6 drops the single-shot rocket and trades one of the spotting systems for a direct-fire cannon. Here’s my favorite of London’s frames. He calls it “Turtle Supremo”. 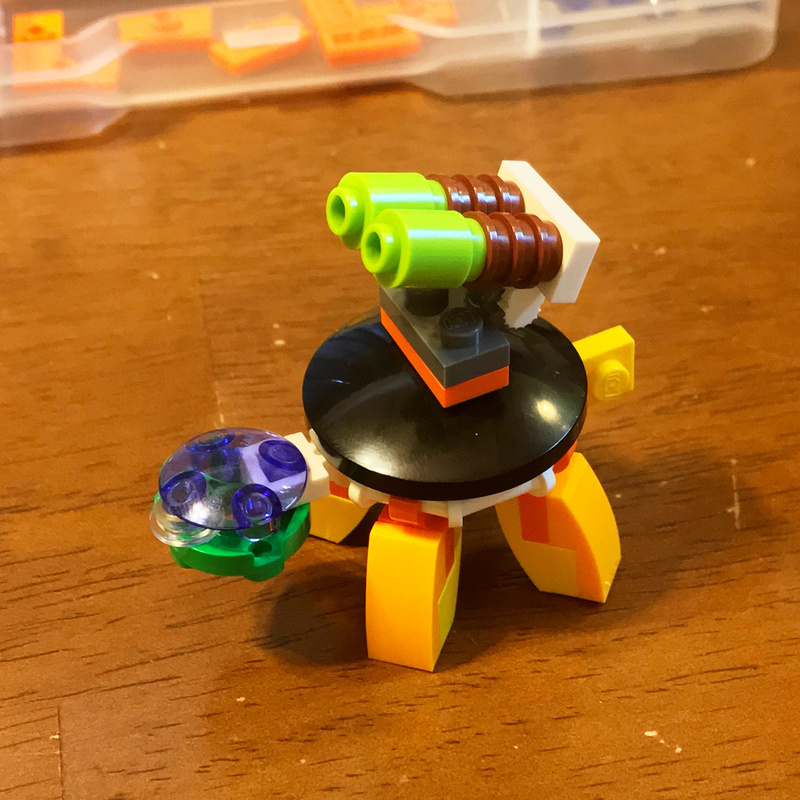 I call it “chain gun turtle”. 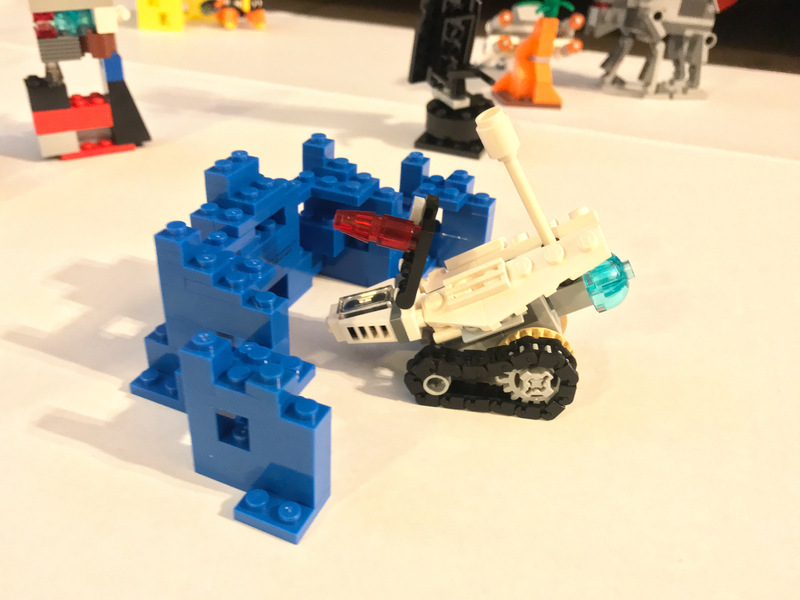 It uses one of the tracks from another Ninjago ice tank as an ammo belt, plus two shields for double defense, and a radar mast for spotting. Here’s London setting up for our big game. At this point we had placed all of our terrain pieces, but no stations or frames. Our game board is two sheets of posterboard from the dollar store, held together on the bottom with masking tape. Here’s my cryo tank in cover at the back edge of the map. My AT-M6 lurks in the background. Here’s a shot from the end of the first turn. London got first attack and he used it very well, blasting most of the systems off of two of my frames, and completely annihilating Orange Turtle. In this photo, his Quadrant Guardian and Turtle Supremo sit unscathed behind terrain features that absorbed the damage from my artillery barrage, while the remains of Orange Turtle litter the battlefield. In return, I damaged but failed to destroy exactly one of his frames. So it’s not looking great for me. At this point I usually write something like, “I’ll keep you posted!” and then I never actually do. So I’m not going to do that this time. UPDATE: Oh wait, I did! I’ll just say that Mobile Frame Zero is a very cool, very fun game. Some of the rules were a little counterintuitive to us, but that might have been because we were coming to this game from a deep familiarity with hex-based wargames, which this decidedly is not. In any case, we haven’t had any questions that weren’t resolved by a careful reading of the rulebook – we haven’t been forced to house-rule anything – and that’s more than I can say for most games. If you’re interested in Mobile Frame Zero, there is a large and active fan community. You can get the game here, in PDF or print-on-demand. You may also want to check out the Mobile Frame Hangar forums and the excellent and prolific Mobile Frame Garage blog. And if you care enough to have made it all the way through this post, I defy you to do an image search for Mobile Frame Zero and not have your jaw drop at least a little bit at the range of frame designs out there. The image above is from the MoF0 wiki (of course there’s a wiki), here. Go have fun.